Since the housing bust, renting has been in and owning a home has been out, especially among young adults who in earlier decades would have been first-time home buyers. As the rate of homeownership has declined, from a peak of nearly 70 percent in 2004 to a 20-year low of 64.3 percent recently, the number of owner-occupied homes has barely budged, while the number occupied by renters has increased by nearly 25 percent. Those trends have led to questions about the future of homeownership. Would more and longer rentals be a bad thing? Are the benefits of homeownership overrated? The answer to the first question is yes; the answer to the second is no. 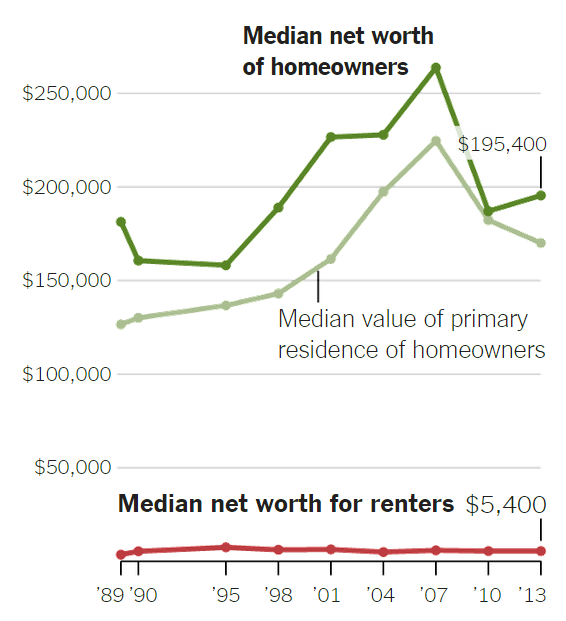 Homeownership long has been central to Americans’ ability to amass wealth; even with the substantial decline in wealth after the housing bust, the net worth of homeowners over time has significantly outpaced that of renters, who tend as a group to accumulate little if any wealth. A recent study by researchers at the Joint Center for Housing Studies at Harvard University analyzed the reasons for these differing outcomes. Paramount among them is that homeownership requires potential buyers to save for a down payment, and forces them to continue to save by paying down a portion of the mortgage principal each month. Renting, in contrast, offers the potential for comparable wealth building only if renters invest an amount equal to a down payment plus any savings from renting. As a practical matter, most renters do not do that. Even in instances where renters have excess cash, saving a substantial amount is difficult without a near-term goal, like a down payment. It is also difficult to systematically invest each month in stocks, bonds or other assets without being compelled to do so. The analysis does not downplay the risks of homeownership or the devastation of the housing bust. But the lesson of that debacle is not for individuals to avoid homeownership or for policy makers to devalue its importance. Rather, the lesson should be to foster conditions under which middle- and lower-income Americans can sustain homeownership and avoid the ruin of foreclosure. For starters, legal and regulatory protections against practices that inflated the housing bubble need to take root. The Dodd-Frank financial reform law, for example, requires lenders to ensure that borrowers have the ability to repay their home loans and outlaws complex mortgage terms that enrich lenders but expose borrowers to payment shocks. The law also established the Consumer Financial Protection Bureau, with the purpose of looking out for consumers’ interests in financial transactions. The C.F.P.B. has gotten off to a good start, but Republicans, who now control Congress, have consistently tried to weaken the agency and the provisions of Dodd-Frank generally. President Obama must be prepared to veto legislation to repeal or weaken mortgage-finance and consumer-protection reforms. Equally important, larger economic forces that make homeownership less possible for working people need to be in the forefront of political debate — even if Republican control of Congress makes actions to address them unlikely. Long-term wage stagnation, for example, has made it increasingly difficult to accumulate enough for a down payment, and has led many homeowners to refinance their mortgages in order to pull out equity for consumer purchases. The solution is to lift wages, not only with new policies like higher minimum wages and toughened labor standards, but also with approaches to managing the economy to ensure that a fair share of growth goes to wages and salaries, rather than going disproportionately to corporate profits. Renting can make sense as a lifestyle choice or because of income constraints. As a means to building wealth, however, there is no practical substitute for homeownership. Posted on December 2, 2014, in Postings. Bookmark the permalink. Leave a comment.